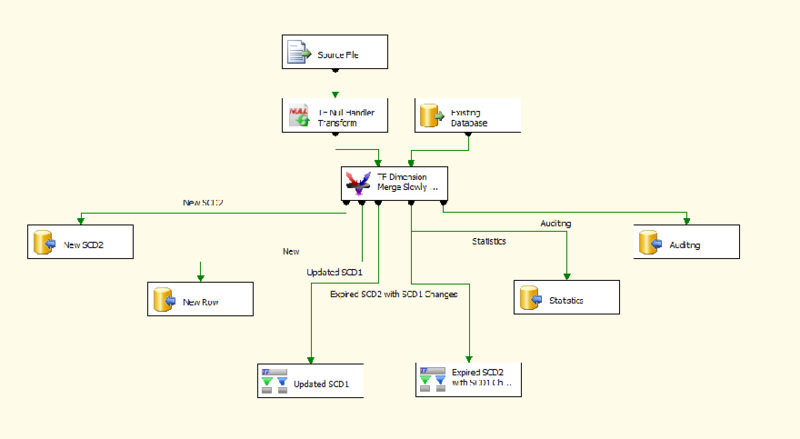 Dimension Merge SCD is a powerful replacement for the native Slowly Changing Dimension (SCD) wizard in SSIS. Dimension Merge SCD is a powerful replacement for the native slowly changing dimension (SCD) wizard in SSIS. This component includes a much more in depth interface than the standard SCD wizard and does not need the OLE DB Command transform. The component loads the data in memory for a much faster response and scalability. Experience a dimension load of up to 700 times faster than native SSIS SCD components. The transform uses the Kimball methodology to load a slowly changing dimension in SSIS much faster than the built-in components for SSIS. Traditionally in SSIS, this is a row-by-row operation! The transform also gives you fine-grain customizability as a developer, letting you solve nearly any business problem. "At the University of Calgary, I can say with confidence that halfway into the conversion effort, using Task Factory has been one of our smartest and most cost-effective software acquisitions in recent memory."